Bonnie Tyler » Music lossless (flac, ape, wav). Music archive LOSSLESS. Music lossless download. Label: Stick Music. Made in France. Label: Hello Musique. Made in Canada. The fourteenth studio album by Welsh singer Bonnie Tyler. It was released on 13 April 2004 by Sony Music Entertainment. The singles from Simply Believe were the two French duets with Kareen Antonn, both originally released as solo singles by Tyler years before. Label: CMC. Made in EU. Heart Strings (also known as Heart & Soul) is the thirteenth studio album released by Welsh singer Bonnie Tyler, released in 2003. It is composed entirely of cover songs that she selected herself. The tracks were recorded with the Prague Philharmonic Orchestra, conducted by Karl Jenkins. The album was first released in Denmark by EMI in 2002, before being released in Europe the next year under the CMC record label. Label: EastWest. Made in Germany. Free Spirit is the eleventh studio album by Welsh singer Bonnie Tyler. It was first released in 1995 by EastWest Records in Europe, and by Atlantic Records in the United States. Label: EastWest. Made in EU. The twelfth studio album by Welsh singer Bonnie Tyler. It was released in 1998 by EastWest Records, following her previous album with EastWest, Free Spirit. The album remains the least commercially successful in Tyler's career as it failed to chart worldwide. 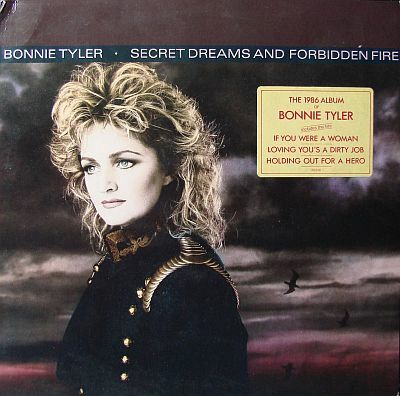 The tenth studio album by Welsh singer Bonnie Tyler. It was released on 11 October 1993, through Hansa Records. The album became Tyler's final collaboration with German producer Dieter Bohlen. The album was released in mainland Europe and was a commercial success. Label: CBS. Made in EU. The seventh studio album by Welsh singer Bonnie Tyler. It was released on 9 May 1988, by Columbia Records, and her final release under the label. The album was recorded in Woodstock, New York, and produced by Desmond Child. Unlike Tyler's previous two releases, the album failed to chart on the Billboard 200, but did see success in Europe. Bitterblue is the eighth studio album by Welsh singer Bonnie Tyler. It was released on 11 November 1991, through Hansa Records. Bitterblue is a pop rock album, described by Dieter Bohlen as "more commercial" than her previous albums. Bohlen began working with Tyler in early 1991, writing and producing multiple songs for the album. Bitterblue also features compositions from Albert Hammond, Nik Kershaw and Giorgio Moroder. Angel Heart is the ninth album by Welsh singer Bonnie Tyler released in 1992. It is the second of three albums Tyler released with Hansa Records, succeeding "Bitterblue" and preceding "Silhouette in Red", achieving European success and spawning two hits; "Fools Lullaby" and "Call Me". The majority of tracks were written by Tyler's producer, Dieter Bohlen. Label: Epic. Made in Japan. Шестой студийный альбом британской певицы Бонни Тайлер, выпущенный в 1986 году. Диск достиг 24 места в британском чарте и 106 место в США, при том, что альбом завоевал успех в континентальной Европе. Как и его предшественник, Secret Dreams and Forbidden Fire был спродюсирован Джимом Штейманом, который написал для альбома четыре песни: «Ravishing», «Loving You’s a Dirty Job but Somebody’s Gotta Do It» и «Holding Out for a Hero», которая ранее вошла в саундтрек к фильму «Свободные». Label: 7T's Records. Made in EU. The fourth studio album by Welsh singer Bonnie Tyler. It became her final work with RCA Records after it was released in January 1981. Ronnie Scott and Steve Wolfe wrote the majority of songs for the album, and co-produced the record with Hugh Murphy. В 1976 году менеджерами, авторами песен и продюсерами певицы становятся Ронни Скотт и Стив Вулф. Первый сингл с новыми продюсерами «Lost In France» к ноябрю 1976 года в чартах Великобритании вышел на 9-е место. Следующий сингл «More Than A Lover» весной 1977 года занял 27 место. В 1977 году в связи с узелковыми утолщениями Бонни подверглась операции на гортани, после которой врачи строго рекомендовали ей не разговаривать в течение полутора месяцев. Однако в один из дней Бонни в порыве отчаяния позволила себе кричать, в результате чего её голос приобрел лёгкую хрипотцу. Вначале певица решила, что это приведёт к окончанию её вокальной карьеры, однако неожиданно для неё сингл «It’s A Heartache» в июне 1978 года достиг третьего места в США и четвёртого в Англии, а одноимённый альбом принёс Тайлер первый «золотой диск». Третий студийный альбом британской рок-певицы Бонни Тайлер. Ремастированное переиздание с двумя дополнительными бонус-треками. Label: Columbia. Made in EU. Label: CBS. Made in NL.